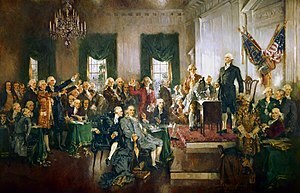 ↑ 1.0 1.1 1.2 1.3 "1787 Constitutional Convention convenes in Philadelphia". This Day in History. History?A&E Television Networks, LLC. Retrieved 15 March 2016. ↑ 2.0 2.1 2.2 2.3 "Virginia Plan (1787)". Our Documents. Retrieved 15 March 2016. ↑ 3.0 3.1 3.2 "New Jersey Plan". U-S-History.com. Retrieved 15 March 2016. ↑ 4.0 4.1 "Milestones: 1784–1800". Office of the Historian, Bureau of Public Affairs, United States Department of State. Retrieved 15 March 2016. This page was last changed on 27 August 2018, at 23:01.